Like many in my generation, I started listening to music on CDs. I used to sit in a rocking chair with my “skip free” portable CD player (I can’t remember if it was a Walkman or not) listening to Now 4 or No Doubt. Around the age of 16 or 17 I was given my first iPod: a 30 GB 5th generation iPod Classic (although at that point it wasn’t called “Classic”). I can vividly remember sitting down at my computer and slowly importing dozens of CDs into iTunes and syncing my iPod. I remember when Tri-tone meant that my CD had been imported, not that I had a new message. I began buying music straight from iTunes instead of visiting the then large, now non-existent CD section at my local Best Buy. Eventually my iPod was stolen. I looked at cheaper iPod knockoffs, but since my car didn’t have an auxiliary port I was still fairly reliant on CDs. 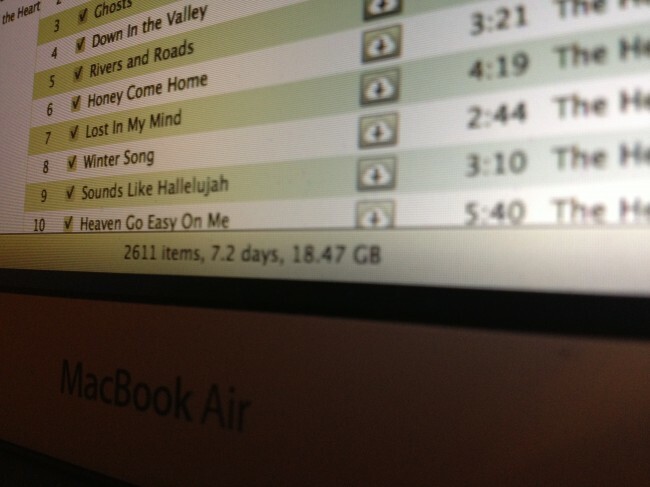 At the time, any music I had purchased through iTunes was copy protected. I contemplated burning CDs of my albums to get rid of the DRM, but I wasn’t convinced of a solution yet. I could store music on my SD card, but that was limited in storage. To make matters worse, more and more devices were being released without an SD card slot. That left physical syncing, which was on option, but at that point why not get an iPod for music? I eventually began to look into services like Spotify and rdio. I wanted to use a subscription service because I was tried of buying music from Amazon and iTunes and trying to organize and sync everything. On top of that, I had old tracks from iTunes that were still laden with DRM and were therefore unplayable on non-Apple devices. Subscription services cost $10 per month for streaming and offline caching so it seemed like a win-win situation. I could have most of my music library available on any device for a low monthly fee and never have to worry about synching album purchases or whether or not certain albums are playable on certain devices. I received one of the rare Spotify accounts that does not require a Facebook sign in from a contest. At the time I wasn’t interested in the solution because I didn’t want to stream music on my phone all the time. Once I did a little more digging and discovered music caching options I began to think about a subscription service much more seriously. I didn’t care for the look of Spotify, but even more importantly, it was beginning to seem like everyone and their mom (literally) was using the service on Facebook. I don’t like being coerced into using Facebook and I’m much more hesitant to support services that support such behavior. Most important of all, however, was Spotify’s lack of music options. While Spotify’s album selection continues to improve, when I was first looking at it, the service lacked many of my favorite albums. Shortly thereafter I began to use rdio. I really liked the app (especially compared to what Spotify calls an app) and rdio’s library had about 95% of the albums I listened to regularly. The app had a consistent interface on both iOS and Android (while Windows Phone’s app remained frustratingly buggy) and while I missed the gapless playback I had become accustomed to, it provided the cloud-based music ecosystem that I had been longing for. When a new album would come out I would open rdio on my phone or computer and tell it to sync the album to my phone to listen to offline. Sure, every now and then I would get the hankering to listen to The Jakes’ EP or Childish Gambino’s EP and be forced into the stock music app, but overall rido had the library, app, and ecosystem that I wanted. After much hand wringing I spent 4 or 5 hours last week cleaning up my iTunes library, buying tracks that had come out since I joined rdio, and setting up iTunes Match/Google Music. While I was deeply in love with rdio and the dream of cloud-based music, I caved into the iTunes Match/Google Music solution because several album labels are still refusing to release their music on streaming services until several months after release while others are refusing to put content on streaming services at all. Those holes in streaming services libraries can be filled in with stock music apps, but maintaining two separate libraries is a nightmare. Sure, I can set up Spotify to sync both my local library and my cloud library, but that means maintaining multiple libraries and doesn’t deal with DRM issues. The solution for me was to pay for iTunes Match. I already had a lot of music that I had purchased through iTunes that I would like DRM free and iTunes often has exclusive tracks for albums. $25 and a few hours later I have the same library that I had with rdio, but I can play literally any song I want on any device. I don’t have to maintain multiple libraries and I don’t have to wonder if an album I want is available to me; I just go download it. I wanted to believe that streaming services were the future of music, but the reality is that services like Spotify and rdio have limited libraries. Until someone can offer me a streaming service that lets me stream every track out there and upload my own personal tracks for streaming, I’m going to stick with iTunes Match/Google Music. Despite the increased expense of paying for albums more often and the heavy initial time investment, iTunes Match/Google Music provides a vastly superior experience. While we have the technology to provide the best music experience, issues like paying artists a fair amount for their work and getting all of the content out there onto any device continue to plague subscription services.